This is a sponsored post, I am a Kmart blogger, though all opinions are my own. Periodically, I write posts about companies and the products that they offer. For my work, I am compensated. When I think about a personal shopper, I think of some uber-wealthy celebrity who has someone bring racks of clothes and bags of goodies to her home. Since I didn't win the PowerBall this week, that fantasy image is not happening to me. Still, I, and you too, can have a personal shopper from Shop Your Way. The idea of having a personal shopper is about convenience, saving time and money. With a Shop Your Way personal shopper, you don't have to spend hours searching for the highest consumer rated vacuum; your shopper will. You don't have to seek the last minute deal on the hot holiday toy; your personal shopper will. At the next party you won't show up in last year's boot cut jeans; your personal shopper will have your hot new embellished jeans waiting for you. I know what you're thinking, all these special perks must cost big money. It doesn't cost you anything. Yes, a Shop Your Way Personal Shopper is free. Even better, these personal shoppers know about hidden deals and offers. They can save you money. Just think about the free time and extra money you will have thanks to this service. From finding a birthday present for the person who has everything to helping Santa tackle his ever growing list, this year you will be thankful for Shop Your Way. Since I like to shop, but I don't have the deep pockets to fund my habit, I enjoy helping as a Shop My Way Personal Shopper. For me, it allows me to think big, explore the hottest trends and help others. I have been known to find unusual, how did you find that, type of gifts. These items can bring such joy to a person. As a personal shopper, I feel like I'm bringing smiles and a little bit of kindness to someone's busy day. Whether you need a helper or want to help someone else, visit www.shopyourway.com to learn more about this program. Don't wait another minute. 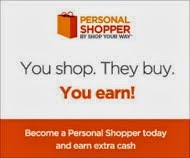 Sign up for a Personal Shopper from Shop Your Way today and jump start your way to easy street. This sounds like a great idea. I think it would be fun to be a personal shopper.